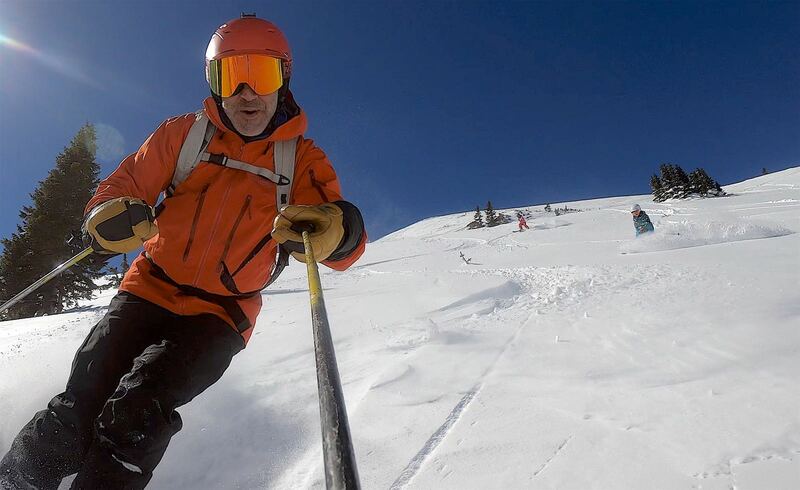 The following story is an honest assessment of Copper Mountain written by Michael Behar. 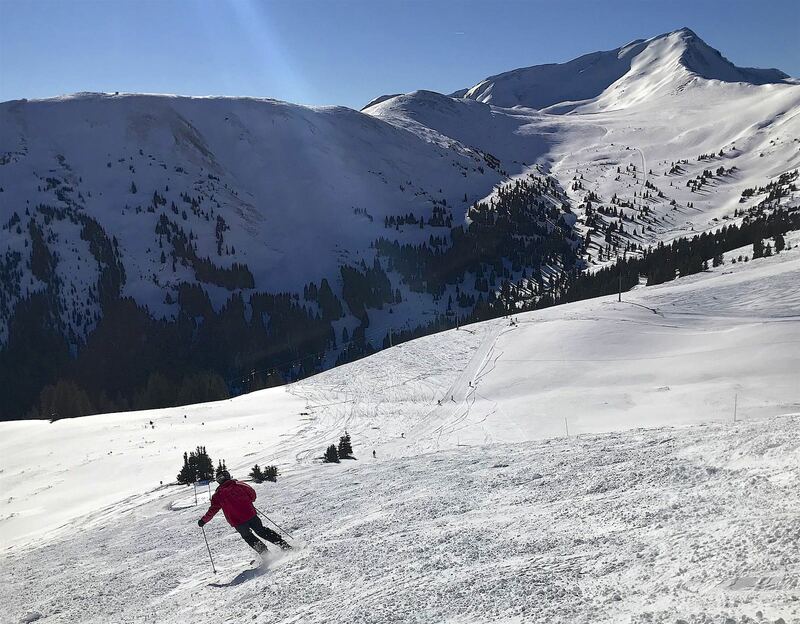 We love transparency, so we want to tell you up front: Some costs of this trip were paid for by Copper Mountain, and Copper Mountain is also paying to promote this story on OpenSnow. Not long after I moved to Colorado in 2006, I began writing for SKI and SKIING magazines, both based in Boulder, where I live. An awesome perk that came with the job was complimentary lift tickets to most Colorado resorts. For a newbie to the state this was optimal, as I wasn’t ready to purchase a pass until I sampled slopes everywhere. On big powder days, my storm-chasing shenanigans often had me blazing down Interstate 70 in my SUV, past Copper Mountain and toward the more renowned resorts (I won’t name names) farther west. Back then, Copper didn’t have much cachet; nobody I knew raved about it, which I construed as "not worth bothering with." I was hugely mistaken. What I discovered a few seasons later was that savvy locals kept Copper mum to preserve its secrets—an extraordinary mountain that arguably flies under-the-radar more than any other resort in North America. From Copper’s base area, its frontside appears squat and unremarkable. What you cannot grasp is its topographical complexity. Copper’s terrain is undulated into deep folds. It’s like surf rolling toward the beach at Banzai Pipeline. From on the sand, only the first wave in the set is visible; and yet behind it, a legion of fun awaits. Copper boasts what its marketing folks describe as "naturally divided terrain." So what does this mean, exactly? When the oceanic and continental plates began ramming into each other about 170 million years ago to forge the Rocky Mountains, the tectonic collision created three distinct areas at Copper. Its east side spans mostly expert terrain; blue runs dominate the resort’s center section; and ample greens and a handful of mellow blues compose its western flank. This layout makes it possible to reach any of the three base areas from almost every frontside lift. Copper’s divided terrain in part convinced me to celebrate my 50th birthday there in December. During the three-day bash, some 31 adults and 15 children skied and snowboarded together. Skill level among those in our group ranged from timid first-timer to accomplished expert. Despite the huge span in ability, it was easy to link up with friends and family. We even created a WhatsApp thread to coordinate meetups, like the impromptu lunch I arranged at the recently opened Downhill Duke’s in Center Village. Accessible from a dozen-plus blues and greens, Duke’s employs an armada of ceiling-mounted heat lamps to keep guests toasty in the all-outdoor venue. For our meal, we indulged in their house specialties: "Mile High" nachos, fried chicken, and Bloody Marys (with extra bacon, of course). For my 50th, conditions were bluebird and balmy. While the snow remained soft throughout the weekend thanks to the low sun-angle in mid-December, I was a bit disappointed we didn’t get a colossal dump. As it turned out, my flatlander buddies relished the weather, chiefly because storminess would have concealed the magnificent scenery that none of them had beheld before. I directed my guests to the Celebrity Ridge surface poma, which leads to a narrow crest just below the summit of Union Peak. From here, at 12,274 feet, the view is unrivaled. Four of Colorado’s iconic ranges—Tenmile, Gore, Mosquito, and Sawatch—rise up like titanic white fangs piercing the heavens. Having grown up in the Pacific Northwest enduring countless dreary days on the slopes, I rarely tire of Colorado’s cloudless skies. But because I’m a powder junkie, my birthday blowout left me determined to return to Copper during a major winter storm cycle. The marketing department agreed, offering to host my family when the snow beckoned. Last month, blizzards pummeled the Rockies for nearly two weeks. When the weather finally broke—following avalanches that shut down Interstate 70 and cut power to Copper—some 90 inches of snow (that’s 7.5 feet!) had piled up at the resort, an all-time record. Copper’s lodging specialists promptly booked us a complimentary two-night stay in a two-bedroom condo at Tucker Mountain Lodge in Center Village, a two-minute walk to the lifts. Right on cue, the skies cleared and the temperature dropped, at which point we found ourselves in an unprecedented winter wonderland. But it was nearing spring—we were five days from the vernal equinox—when the sun’s solar intensity at high elevation would turn Colorado’s legendary fluff into mush. To beat the heat, our strategy was to ski the mountain from east to west, starting with the slopes that get sun-blasted early, saving the north- and west-facing runs until afternoon. Copper Mountain Ski & Ride School provided Sasha with two days of lessons so I could explore the tougher terrain with Ashley, Simon, and his school-buddy Matthew, who joined us for the trip. We hopped on the high-speed American Eagle, a combination six-person chair and eight-person gondola that began spinning in December (it’s also North America’s first direct-drive lift, which is more energy efficient and reliable than conventional mechanisms because of its simplified gearing system). We offloaded Eagle and made the short jaunt to the Excelerator quad and into double-black Resolution Bowl, where bottomless turns funneled us into Sawtooth. Here, the heavy snowfall had buried the usual bumps, transforming the run into a whoop-de-doo playground. After riding the Resolution triple chair, we sampled the flowy blacks that convene at the base of Alpine, a two-person fixed-grip lift. Visitors to Copper often ignore Alpine—and the 150-acre swath of terrain it services—instead beelining it to the back bowls. I’d call this an oversight because typically it takes patrollers a few hours to complete avalanche mitigation in the bowls. This leaves Alpine-accessed runs, including my favorites—Far East, Too Much, and Black Bear Glade—often untracked for much of the morning, as they were the day we hit them. I was watching the time prodigiously. At 10 am, the Tucker Mountain Snowcat would begin operating. It shuttles skier and riders (for free) from the base of the Mountain Chief lift to a wide saddle situated between Tucker Mountain (12,337 feet) and Jacques Peak (13,205 feet). The snowcat only operates on Fridays, Saturdays, and Sundays. It was Friday, which meant that none of the nine named chutes and glades had been touched since the prior weekend—and, better yet, since 15 inches of fresh had fallen. 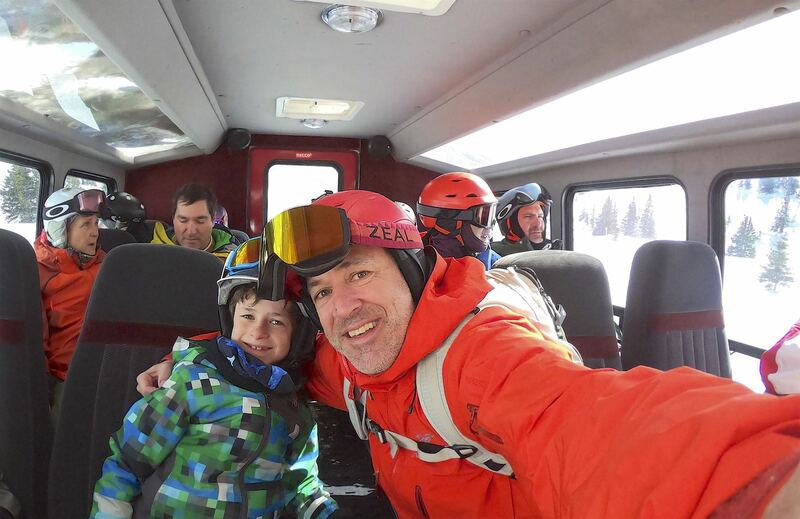 We were first on the snowcat (along with a handful of ski patrollers), plopping ourselves onto comfy airline-style seats inside its roomy cabin. As the snowcat chugged uphill, the patrollers reviewed basic avalanche safety (and reassured us that should an inbound slide occur, their team of avalanche dogs would promptly sniff us out). After disembarking, we hiked 15 minutes up a gently pitched ridge to Tucker’s summit, snapped a few scenic selfies, and then plunged into Freemont Glades, cutting first tracks. The hike up Tucker and subsequent face-shot line through the glades left our stomachs growling. So we departed the back bowls on the Blackjack chair to find ourselves a lunch spot in Center Village. While savoring the Korean beef tacos with kimchi slaw at the Ten Mile Tavern, I was wistful about our snowcat adventure, as it was likely the last time we’d experience it. Copper plans to install a fixed-grip triple lift this summer, rising 1,100 vertical feet to service Tucker Mountain, eliminating the need for a snowcat or hike. Copper’s public relations manager, Taylor Prather, joined us for lunch. She informed me that Copper is pumping more than $100 million into the resort over the next three years. Perhaps her biggest headline was the construction of a 127-room hotel—the first-ever hotel at Copper—located on a portion of the now-existing Chapel parking lot. Its grand opening is set for sometime in 2020. Another upgrade: Copper will replace the aging Solitude Station with a 25,000-square-foot lodge, featuring a restaurant, lounge and bar, private dining, and cafeteria. And there are also plans underway for a ski-in/ski-out boutique hotel at the base of the Alpine lift. I was excited to hear about 86 acres of snowmaking being added to the Ore Deal run above East Village. As you recall, last season (2017/2018) was a bust; by early December, Copper’s snowpack was almost non-existent. 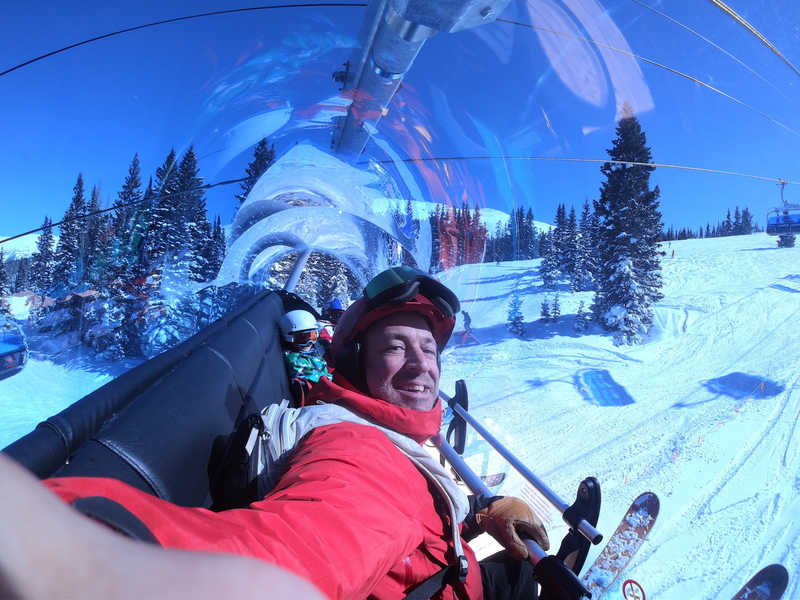 But Simon and I, desperate to ski, went anyway and were amazed to discover that we could make several top-to-bottom laps beneath the Super Bee six-person chair, Copper’s longest lift at 2,293 vertical feet. By next season, Copper’s total snowmaking capacity will encompass 355 acres, making it my go-to for early season turns. By the time we finished lunch, the potent late-winter sun had made mincemeat of Copper’s east- and south-facing slopes. The logical next destination was northwest-oriented Hallelujah Ridge off the Storm King T-bar. The record snowfall had filled in runs—Ute Overlook, Looking Glass, and Cache Glades—that in prior seasons had been often closed due to prevailing westerly winds scouring the upper sections and exposing gnarly scree fields. With everything now sufficiently covered, we made three laps from the ridge, dropping into lines I’d never skied, where the snow was still blower and thigh-deep. Next, we headed over to the Sierra chair to reach Union Meadows. To our surprise, the top half—above treeline—was still trackless. And then we followed the boundary rope into tighter trees, where ample stashes remained. The following day, we made our usual rounds, working the mountain from east to west under bluebird skies. Low humidity and overnight temps in the teens had sucked moisture from the snow (the technical term is sublimated), magically transforming it into spongy joy. But we quit early, at 2 pm, in order to make an appointment for a two-hour private lesson at the Woodward Barn, which Copper had arranged for the boys. 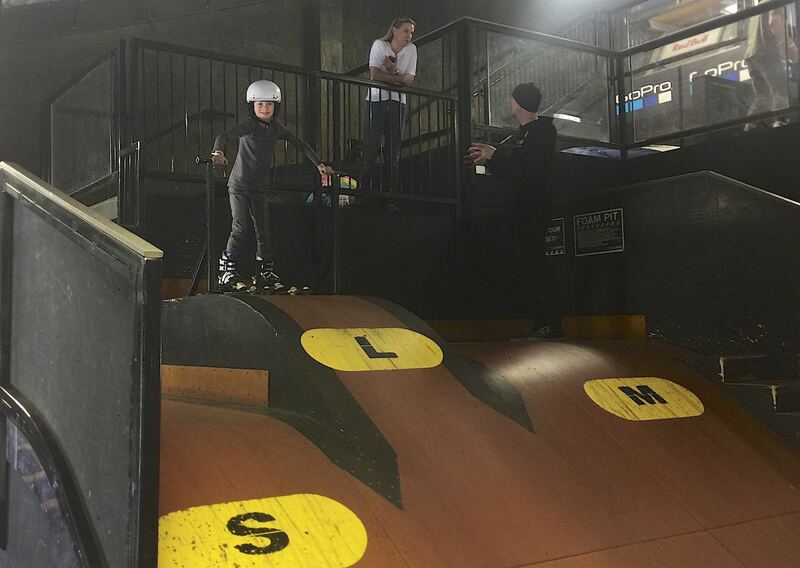 Upon entering the 19,400-square-foot professional indoor training facility, Simon and Matthew witnessed fellow rippers wearing specially designed skis outfitted with Rollerblade-type wheels hucking massive airs off steep wooden ramps into cushy foam pits. That got them stoked. 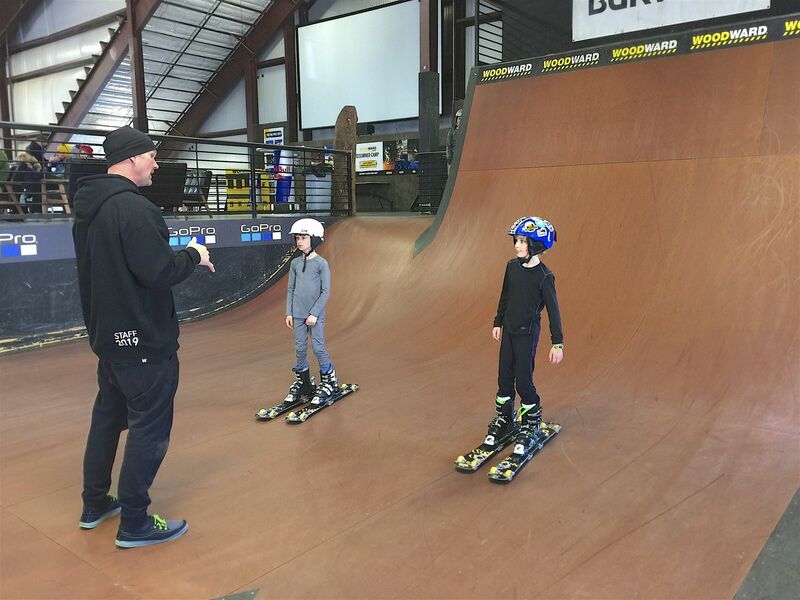 Woodward coaches Matti Wade and Mike Steinbock wasted no time explaining slopestyle basics, such as straight airs, grabs, spins, and flips. After a short session on the Olympic-grade flybed trampolines, Simon and Matthew donned their ski boots. They each clipped into a pair of Woodward’s trademarked ParkSkis and sent their first aerials off the mini-ramps. Next winter, Copper will debut the on-mountain Woodward Peace Park, a more expansive terrain setup that’ll be engineered for all skill levels and open to the public. Meanwhile, my kids already are demanding to go back, especially after learning that on April 21—Copper’s currently scheduled closing date—the resort will host the world’s largest Easter egg hunt, scattering 65,000 eggs across 2,500 acres in Center Village. Adults can partake, too: An on-mountain hunt stashes a dozen so-called “golden eggs” across various runs. The eggs contain prizes, including Copper passes for next year. While I don’t need coaxing to ski at Copper, winning a gratis pass might convince me to wrangle the family for one last weekend—a fitting farewell to an epic season. 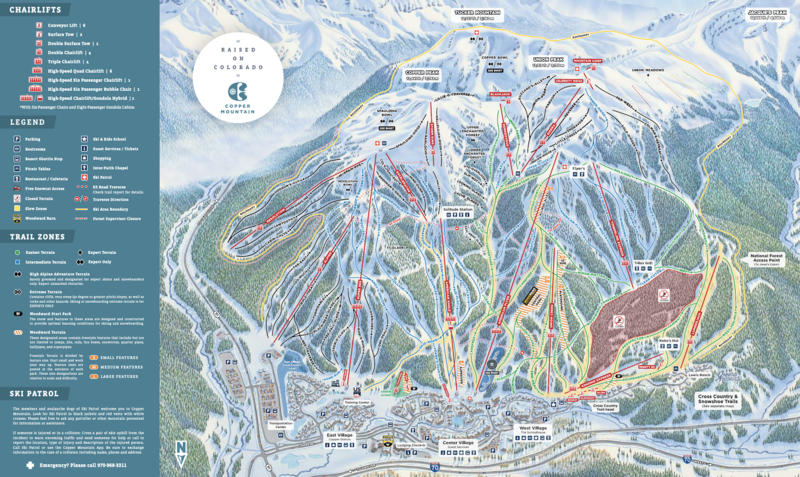 Copper Mountain offers 2,465 acres of skiable terrain, accessed by 22 lifts and 126 trails. The mountain stretches from a base elevation of 9,712 feet to a summit elevation of 12,313 feet. Our friends at Zrankings list Copper Mountain's True Annual Snowfall at 278 inches. 44% of the mountain is considered difficult terrain, 31% intermediate, and 25% easy terrain. 55% of the mountain features a north-facing aspect, 25% east-facing, 15% west-facing, and 5% south-facing. The lift operating hours run from 9:00 am - 4:00 pm Monday through Friday and 8:30 am - 4:00 pm Saturdays, Sundays, and holidays (weather and lift depending). 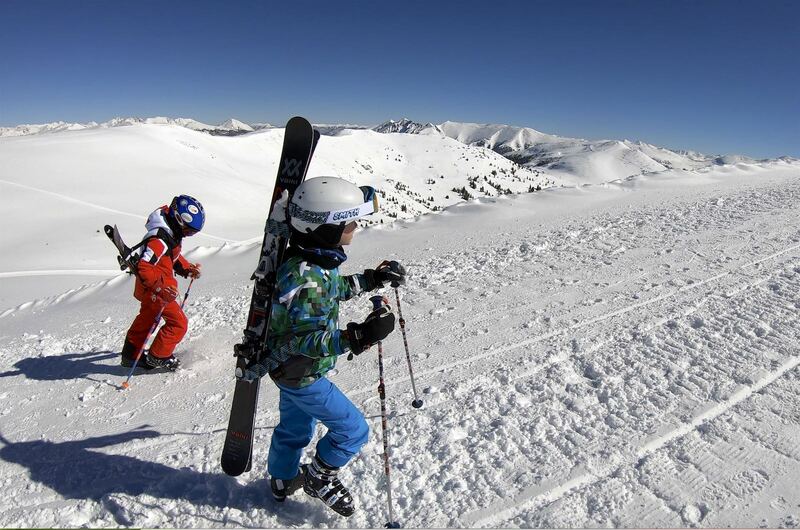 Visit CopperColorado.com for all lodging, event, and other ski-related information. 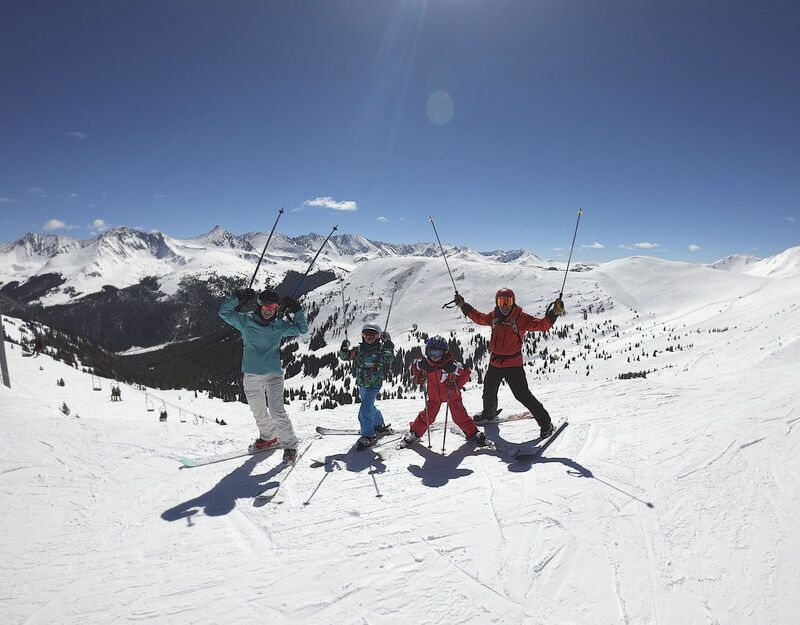 This trip report was sponsored in partnership with our friends at Copper Mountain.